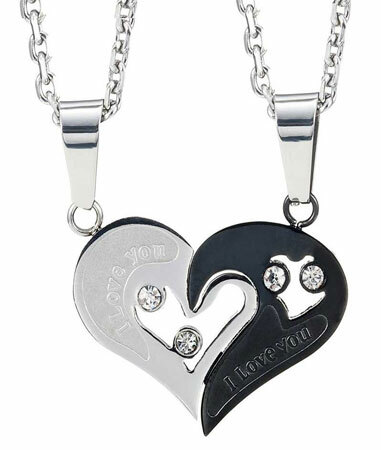 This Stunning 2pcs His and Hers Heart Couples matching necklace set is a cute necklace. These two heart pieces are very good quality and will be liked by everyone. Among of them one is silver color whereas another is black color. Both are engraved with “I Love You”. Each half personalized the commitment of that special someone. They could be a wonderful Valentines Day gift for a couple. The 316L Shining Stainless Steel will not rust or stain or oxidized and it’s one of the most bio-compatible metals. It is the product of Urban Jewelry which is located in New York City. Urban Jewelry is an exclusive brand that collects latest styles, unique pieces stainless steel silver and leather accessories which will make you happy.